A Chevrolet Step-Van P30 now living in the UK as a coffee van. "All the info I have..."
Never one to let a challenge go by, I answered: “It might be possible”. The next thing I knew, the vehicle was on a ship crossing the Atlantic toward the UK. 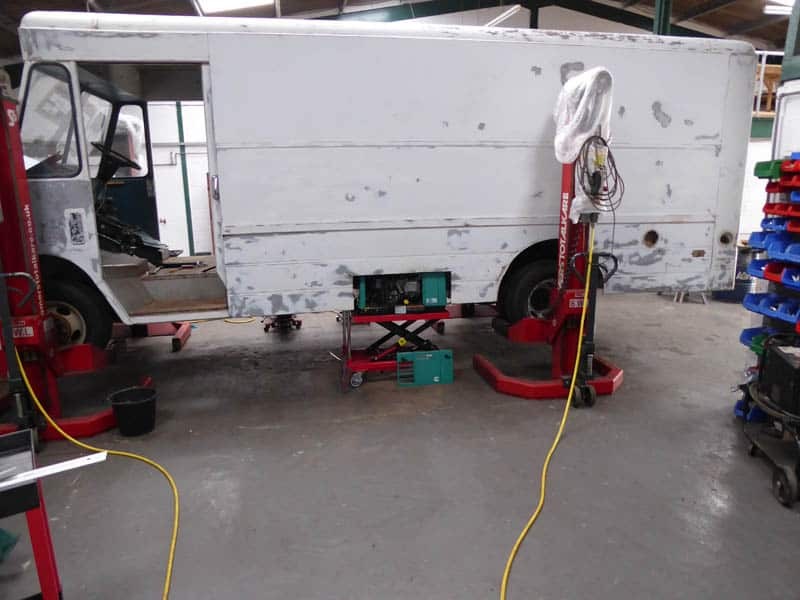 In early July, the Chevrolet P30 Step-Van arrived at LAS Motorhomes workshop on the back of the recovery truck. I rang the customer to tell him that his Step-Van had arrived and cautiously informed him that was little more than an empty shell. We both agreed that a detailed inspection of the vehicle was required to fully understand the current condition and develop a plan. It didn’t take me long to find out that the engine had a water leak that wasn’t visible externally. I drained the engine sump to find half its contents were from the cooling system. With the odometer reading 130,000 miles, I decided to check the timing chain free play; this was twice the tolerance. With the sump removed, the cooling system was pressurised and the radiator water ran down number two cylinder onto the floor. ‘NEW ENGINE REQUIRED?’. We concluded the timing chain was severely stretched, and had altered the valve timing, increasing the cylinder temperature, and cracking the cylinder heads. By now I’d put together a rather list of defects, so I hastily arranged a meeting to discuss my findings with the new owner. We went through the list and explained the potential cost implications. 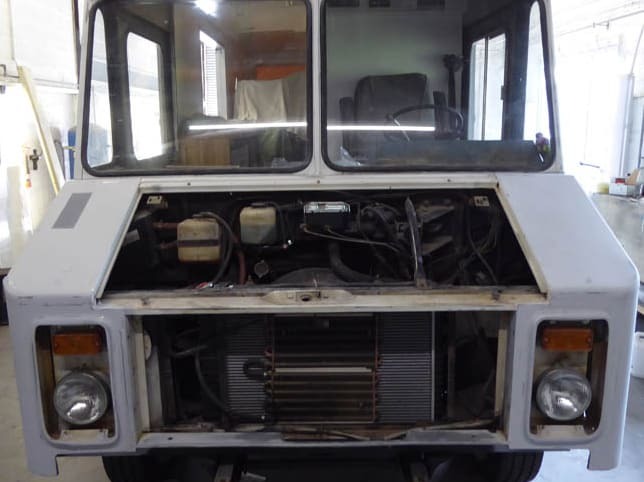 I expected him to be shocked with the amount of work that needed to be carried out, however the owner was very keen to move the project forward, so we started forming a plan to bring the Step-Van back from the brink. We decided to replace the engine with a reconditioned unit, and to carry out all the repairs on the list. 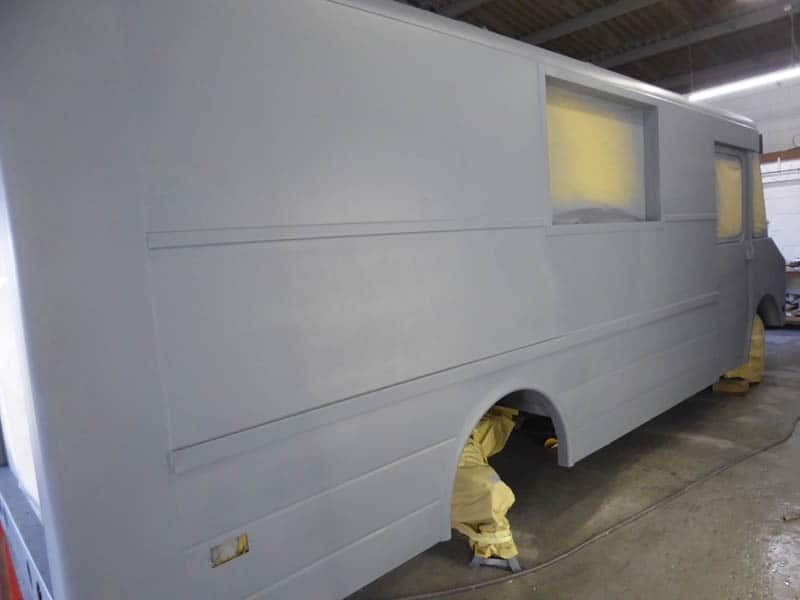 For the interior, we would line out the rear of the Step-Van, fit the electrics, and add extractor fans and LED lighting. 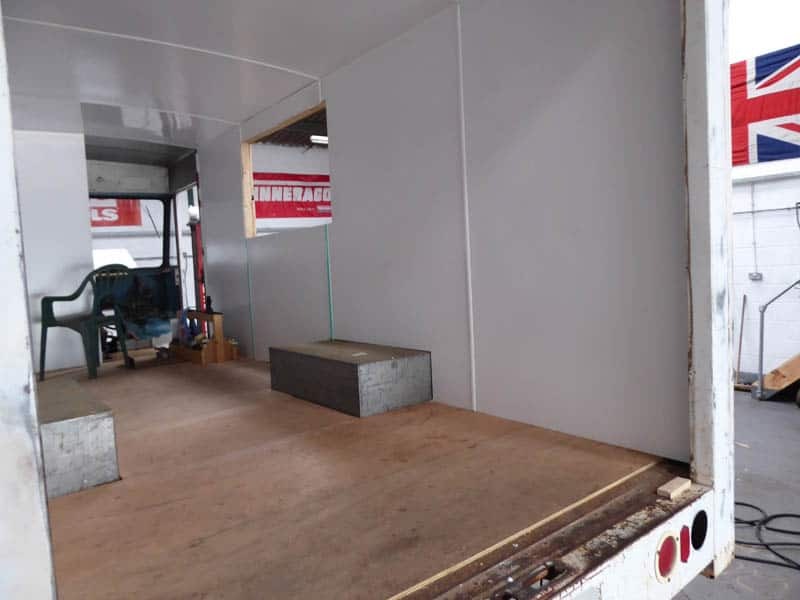 Once this initial interior fitment was completed, the customer would take the vehicle to a specialist company who would fit the rear out with the coffee machine and fridges, etc. To start, we removed the aluminium inner body cladding and the rear roller shutter door. Removing the door gave us more headroom, whilst removing the inner aluminium panels gave us access to fit electrical cables and insulation behind the whiteboarding. We finished this stage by fitting a plywood floor. The next stage was to cut out a service hatch on the right-hand side, with a bulkhead behind the driver’s seat where the main electrics would be fitted. Following this, we fitted an Onan 3.3 KYFR gas generator to the left-hand underside of the vehicle, the opposite side to the serving hatch, and an on-board gas supply tank. This would supply the power to the fridges, panini press and till when a mains hook up was unavailable. As the rear roller shutter door had been removed earlier in the strip down, we were now considering various options to close the rear of the van, and how to incorporate the access steps. 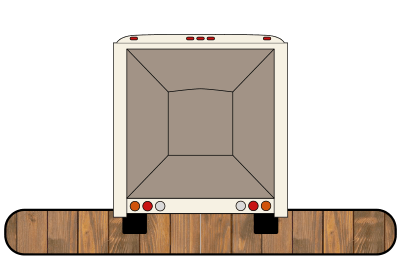 It was agreed that a pair or rear doors would be constructed, with a set of steps that would fold vertically enabling you to shut the doors. Whilst ordering the LED lights and extractor fans I noticed some blue LED-illuminated door handles and decided these would be perfect for the interior. I must admit the back door and handle looked great when finished. 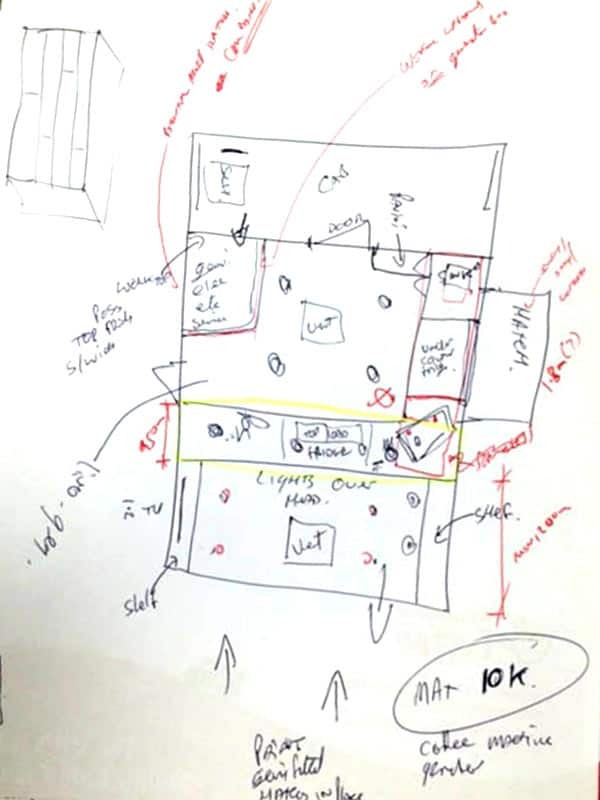 There were quite a few discussions over the layout of the van and entry points. The van had a regular contract serving an industrial estate where customers would enter and exit from the rear via the aluminium steps, holding on to the blue lit LED handles. 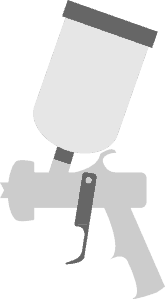 The van would have the use of a 32 amp hook up which would power the water boiler, fridges, coffee machine, etc. At weekends the van would be used for shows. The fridges and electric panini machine would be powered by the gas generator. The duel fuel coffee machine, would now run on gas from the same supply. 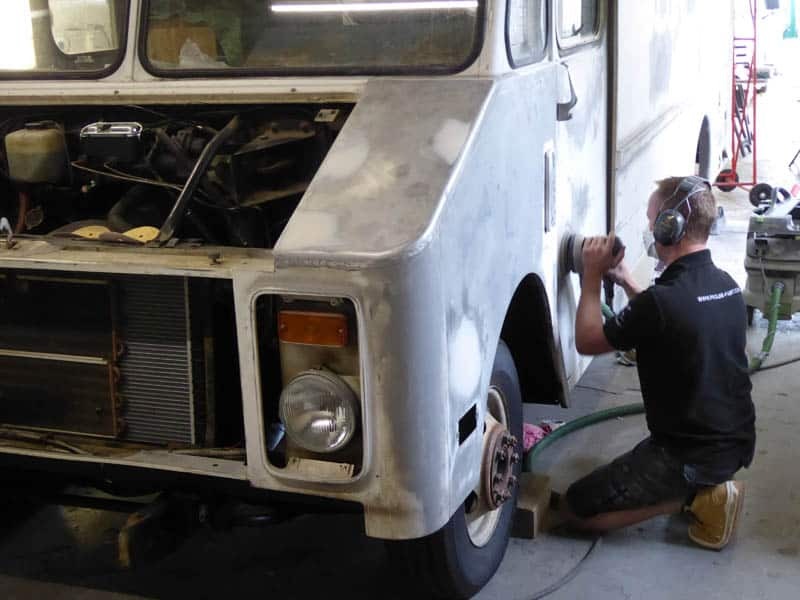 The van had arrived as some sort of white with a yellow tinge, but after a good steam clean it looked a lot better; the original paint firmly adhered to the body panels. We attacked the white panels with a DA sander to see if the original paint could be successfully flattened down so that we could give the customer an accurate price for re-painting it. The customer was concerned about the price relative to another he had received, so we sat down to go through both estimates, like-for-like, to see where the differences were. Our estimations included painting the roof with a special white heat reflective paint. Because the body was aluminium, it goes without saying that the van would be like an oven in the hot summer sun. 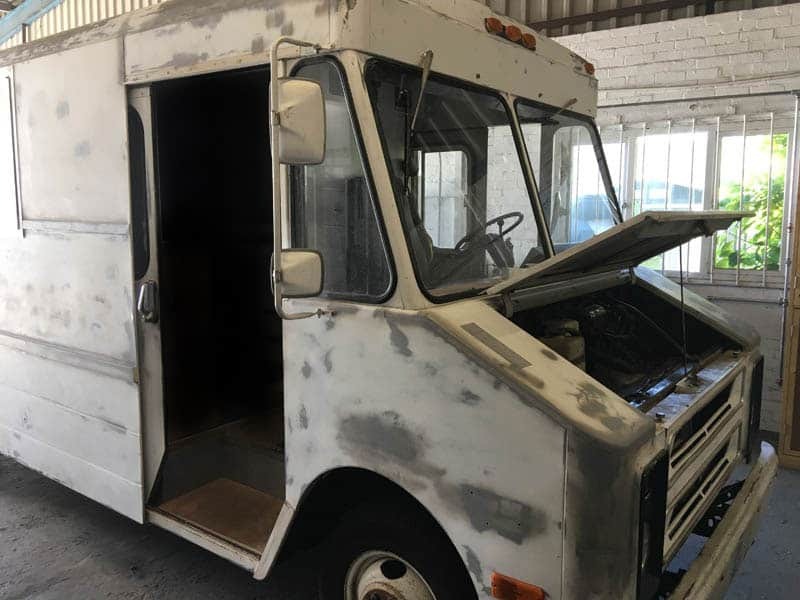 The customer called me and requested that LAS paint the Step-Van. As the final exterior colour, black, would show up any bodywork repairs or imperfections, my first thoughts were ‘well we have flattened out most of the paintwork, let’s do it!’. When we primed the van we noticed a reaction was taking place along the side. 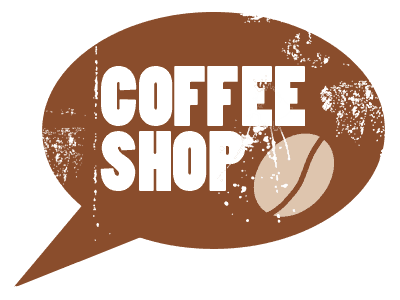 One of my policies is that if I am not happy with it then the customer won’t be either. 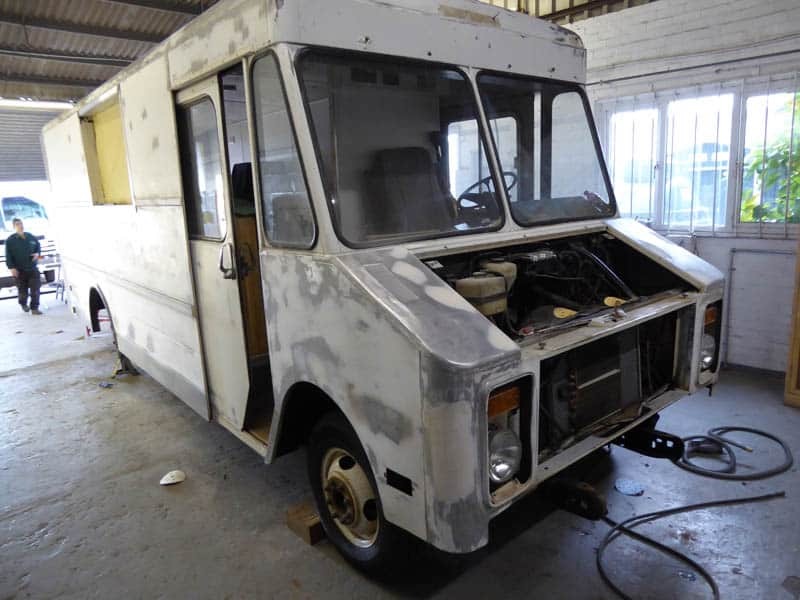 The suspect patches had to be stripped back to bare metal, but once it was done I knew that we were in for a nice paint job. 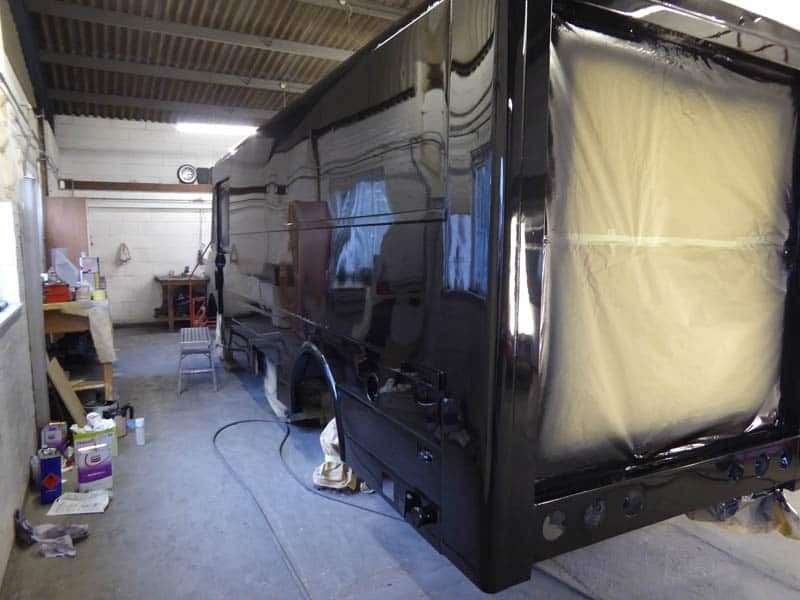 We continued to paint the van in the chosen colour, a black used by VW on their commercial vehicles. While the design was in its infancy, I had mentioned that we had an awning that would look fantastic over the serving hatch on the right-hand side. The awning was too long, so would need the awning roller and cover shortening, and a new set of arms and springs. I showed the customer the awning, who thought the modified awning would work and look fantastic! Now we were onto the finishing touches. Above, you can see the serving hatch open and the clip on serving shelf, fabricated from the same wood we used for the work tops, in place. The coffee van was now complete and ready to use. If you have an idea let LAS Motorhomes make it happen.